"This gravy uses the natural liquid from chicken, pork, beef, or turkey after it has cooked in the Instant Pot®." Turn on a multi-functional pressure cooker (such as Instant Pot(R)) and select Saute function. Combine water and cornstarch in the pot and stir to create a slurry. Add pan juices, stirring constantly until thickened, about 3 minutes. Add garlic salt and stir to incorporate. Add browning sauce. 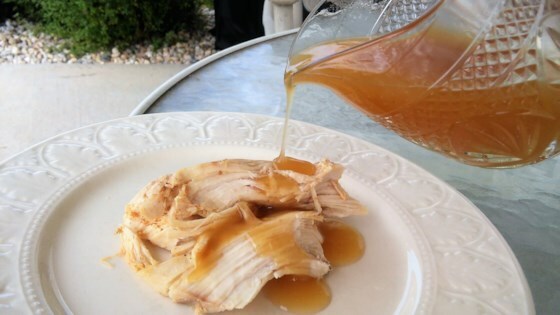 You can use drippings from pressure-cooked chicken, turkey, pork, or other meats. I use the browning sauce only for beef gravy.